A new New Zealand study of rugby players provides additional evidence that the King-Devick Test, a simple two-minute test of rapid eye movement, is an accurate "remove-from-play" sideline concussion assessment tool, one which can accurately identify athletes with concussion, even when they neither display obvious concussion signs nor report any symptoms. 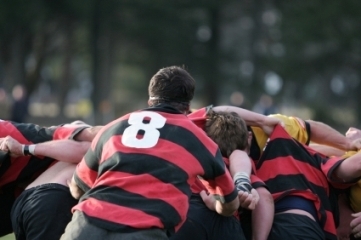 The rugby study, reported online in the Journal of Neurological Sciences, adds to a growing and impressive body of research[2,3,4] establishing the value of King-Devick as a sideline assessment tool to complement the many other diagnostic sport-related concussion assessment tools currently in use, such as SCAT2. Researchers at the Sports Performance Research Institute (SPRI) in New Zealand recorded five witnessed concussions over the course of the season, while 17 were unrecognized and only identified with the KD. The findings of five witnessed concussions was "not unexpected," said lead author Doug King, Ph.D. of SPRI (no relation to the King of King-Devick), "but the number of unrecognized concussions is a concern. If the present finding is any indication that there is a ratio of 3.4 identified concussions for every witnessed concussion, then studies [are] under-estimating the incidence of concussions," he said. The silver lining in the study's finding is that the KD test was able to identify so many unwitnessed and unreported concussions so that such athletes could be removed from play and referred for a more complete assessment away from the sport sideline, and, in so doing, prevent the return of athletes with suspected concussion from returning to the playing field, where they run the risk of further injury to their brain, which evidence suggests, lengthens and complicates recovery, and, worse, increases the chance of catastrophic injury or even death from second impact syndrome. A visual recognition and reaction time test utilized for over 25 years to track rapid eye movements called saccades, and detect reading difficulties such as dylexia, the K-D test requires a test-taker to read from left to right eight rows of unevenly spaced, single digit numbers on three test cards as quickly and accurately as possible. Originally developed in the 1980's by optometrists Al King and Steve Devick at the Illinois College of Optometry, the K-D test provides objective measures of many aspects of brain function, including subcortical (subconscious) pathways that extend beyond eye movements. It not only measures the speed of rapid number naming, thus capturing impairment of eye movements, but the test-taker's balance, attention, language and visual recognition skills and other correlates of suboptimal brain function. The two-minute sideline test can be administered via an iPad app or with physical test-cards, players when they come off the field and can be applied to all contact sports including football, soccer, hockey, basketball, among others. Researchers followed 37 elite New Zealand rugby players between the ages 18 and 26 over the course of a 24 game season. Before the season, every player completed a questionnaire on concussion history, a baseline PCSS (post-concussion symptom self-assessment), and two trials of the KD. During matches, players observed to have received a direct blow to the head, were slow to rise from a tackle or collision, or appeared unsteady on their feet following a collision, were assessed on the field, and if suspected of having sustained a concussion were removed from play. Players sustaining a loss of consciousness were evaluated for a cervical spine injury and managed accordingly. Those players who reported any sign(s) of concussion or who were suspected to have sustained a concussion were removed from the match and assessed with the KD on the sideline and the SCAT2 (Sports Concussion Assessment Tool 2) post-match. There were no significant differences in witnessed and unwittnessed concussions on the SCAT2, and a significant correlation between SCAT2 and KD scores. Athletes with unrecognized concussions identified with the KD recorded on average fewer symptoms, lower symptom severity, better balance, and better immediate and delayed memory scores than those with witnessed concussions but none of these differences were significant. However, witnessed concussions recorded, on average, a significantly longer KD on the day of injury than unrecognized concussions when compared with their baseline KD, while unrecognized concussions recorded a significant decline in their KD on the third day after concussion. Most, but not all, players with an unrecognized concussion had their KD equal to, but not significantly faster than their baseline KD by day 14 post-injury. "The current findings provide further evidence in support of previous studies on the KD as a sideline tool designed to complement the many other diagnostic sport-related concussion assessment tools available," the study says. "The KD was useful in rapidly identifying players that had a witnessed concussion incident by being able to provide instant feedback to the player and to team management. The KD was [also] able to identify players that had not shown, or reported, any signs or symptoms of a concussion but who had meaningful head injury. The data support previous studies that the KD is sensitive to neurological changes such as those seen in sports-related concussion." The test has shown such promise for sideline assessment of concussion that consumer advocate Ralph Nader is now calling for its mandatory use at all levels of sports, from the pros down to youth leagues. In a conversation with MomsTEAM CEO Brooke de Lench, Cindy Parlow, former US Olympic Women's Soccer player and current coach of the Portland Thorns Football Club, a new franchise in the newly-formed National Women's Soccer League, and spokesperson for the King Devick test, said she feels the King-Devick test would have helped identify many of the concussions she received while playing soccer. She plans on utilizing the K-D test as a sideline test for her team when they begin play this spring. 2. King D, Clark T, Gissanec C. Use of a rapid visual screening tool for the assessment of concussion in amateur rugby league: A pilot study. J. Neuro Sci . http://dx.doi.org/10.1016/j.jns.2012.05.049. 3. Galetta K, Brandes L, Maki K, Dziemiannowicz M, Laudano E., Allen M, Lawler K, Sennett B, Wiebe D, Devick S, Messner L, Galetta S, Balcer L. The King-Devick test and sports-related concussion: Study of a rapid visual screening tool in a collegiate cohort. J. Neuro Sci. 2011; 309(1):34-39. 4. Galetta KM, Barret J, Allen M, et. al. The King-Devick test as a determinant of head trauma and concussion in boxers and MMA fighters. Neurology (2011); 76:1456-1462. 5. McCrea M, Hammeke T, Olsen G, et. al. Unreported concussion in high school football players: implications for prevention. Clin J. Sport Med 2004;14:13-17. 6. Echlin P, Tator C, et al. A prospective study of physician-observed concussions during junior ice hockey: implications for incidence rates. Neurosurg Focus 2010;29(5):E4. 7. Cantu R, Concussions and Our Kids (Houghton Mifflin Harcourt 2012), citing Flick K, Lyman S, Marx RG. American collegiate men's ice hockey: an analysis of injuries. Am J Sports Med 2005;33:183-187. 8. Dziemianowicz M, Kirschen MP, Pukenas BA, Laudano E, Balcer LJ, Galetta SL. Sport-Related Concussion Testing. Curr Neurol Neurosci Rep 2012 (published online July 13, 2012)(DOI:10.1007/s11910-012-0299-y).